Black Ice Software - Try Printer Driver 14.85 with a new MSI Installer for large scale deployment! Try Printer Driver 14.85 with a new MSI Installer for large scale deployment! 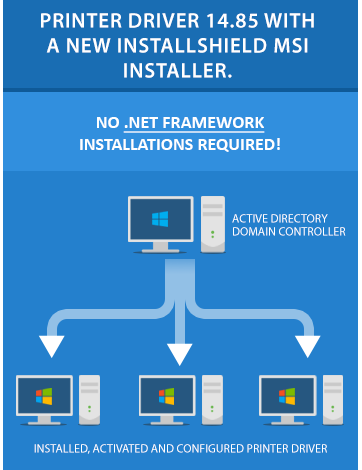 The New InstallShield based MSI installer is perfect for secure environments without .NET framework! The latest ColorPlus, PDF and TIFF/Monochrome Printer Driver is now available in the form of a InstallShield MSI installer. The new InstallShield MSI installer does not require .NET framework to be installed on the computers, bypassing the security vulnerabilities of the .NET framework. The new InstallShield MSI installer is the perfect solution for secure environments greatly simplifying large scale deployment and allowing pre-configuration of the Printer Driver for the users. Add a Custom Printer Name to re-brand the Black Ice Printer Driver! Pre-configure the printer driver using the INI file, such as file format, output directory, and more. Every feature of the printer driver can be pre-configured. Add Agent (Task printers) printers. Configure a single or multiple Agent printer for reoccurring or specific tasks. Profile Configuration to use a specific document conversion profile with the printer driver. For the InstallShield MSI installer availability, please contact sales@blackice.com.